Kavajuice: "I can’t seem to get anything in terms of new released movies. It’s either a Short Wait or a Long Wait. Don’t get me wrong, I expect to wait if I am not on the queue for the next shipment but c’mon. Don’t they anticipate movies like 300 to have tons of viewers. Waiting 4 weeks and still nothing - 300’s DVD release was July 31, 2007. Don’t think I’ll get till September, if I’m lucky." Netflix and Blockbuster allocate movies based on your usage profile, so some customers might see new releases immediately, while it can take a long time for others. ..and my Blockbuster queue shows "Long Wait:"
What have you found? How long do you wait for new releases from Netflix & Blockbuster? 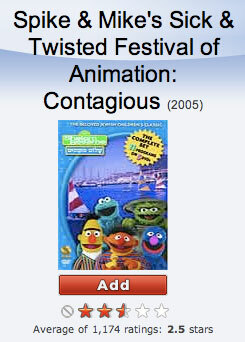 Craig discovered an amusing movie box cover for the unrated movie Spike & Mike's Sick & Twisted Festival of Animation: Contagious. With titles such as "Mama, I'm a Thug," "Slaughter Day," "Puke a Pound" and "Lloyd Loses His Lunch," these outrageous shorts from animation purveyors Spike and Mike won't disappoint if you're in the mood for, well, sick and twisted 'toons. The dynamic duo's collection features more than 30 short films intended to shock your socks off and includes six cheeky shorts from award-winning cartoonist Bill Plympton. It'll be interesting to see how long it takes for Netflix to fix the listing. Netflix DVD Scratch or Dirt Problems? Peter writes, "I've been a Netflix customer for 4 or 5 years. It seems that 50% of the DVDs get stuck and then return to the beginning of the movie. Or, they simply skip. I guess most users don't care a damn about how they handle the disk, but wouldn't one think that Netflix would have a process that at lest cleans every returned disk?" I know that Netflix workers look at every DVD and they have a disc cleaning process, but I'm wondering if this is a DVD player problem. Is anyone else having problems playing movies from Netflix or Blockbuster? Take a look at the movies you have at home -- are they scratched or dirty? Hollywood Reporter: Netflix's Red Envelope Entertainment and New Line will distribute The Business of Being Born, Ricki Lake's controversial documentary about giving birth. "When Abby and I set out to make this film, our goal was to help inform as many women as possible about the full range of choices they have," said Lake. "The one-two punch of Netflix and New Line combined with a theatrical release in places like New York and LA, where women's choices are ironically more limited statistically, will help us achieve this goal in the most meaningful way possible." Thanks to Eazyguy for sending this in. Listen careful to the copyright notice on this football broadcast... You can't share your "account" this game without the NFL's consent. What ever happened to "fair use?" Every time an American consumer opens a book, plays a DVD, or watches a wide range of broadcast programs he or she is confronted by strong language warning of what they are not allowed to do with that product. By design or effect, many of these warnings are misleading and harmful to millions of American consumers, customers, and businesses. These ubiquitous statements often include gross misrepresentations of federal law and characterize as unlawful acts that are explicitly permitted by law. Many such warnings forbid unauthorized copying and sharing of any part of their works, even when such copying or sharing is fair use and is permitted by law and in fact by the Constitution itself. Netflix issued a press release to announce that Instant Watching went from 5 million to 10 million viewings in 6 weeks. The company attributed the rapid acceleration of instant watching viewership to more subscribers becoming aware of the feature and the influx of exciting new titles such as the feature films "Letters from Iwo Jima," "Pan's Labyrinth" and "The Good German" and the hit BBC TV show "The Office" starring Ricky Gervais. Are you using Watch Now? What do you like or dislike about the service? Farhad Manjoo from Salon spent some time evaluating Netflix and Blockbuster, and writes about his observations in Why Blockbuster is Gaining on Netflix. I'm misquoted in the story, but it could be because I talk fast during interviews. The story says I waited 3 months for Lost in Translation from Blockbuster, but in 2004 I waited 3 months for the movie to arrive from Netflix. Dave Winer (also quoted in the story) has written a followup to the story, where he says that he does all of his interviews by e-mail so he isn't misquoted. Arrgghh. It looks like I misquoted Dave Winer (the story quoted a blog post from Dave Winer, not an e-mail interview). I'm still considering doing interviews by e-mail, so I'm not misquoted and have a record of the exchange. Readers have reported two new Netflx drop points. Todd reports a new drop point in Springfield, Missouri, and Robert reports one in Gaylord, Michigan. Netflix picks up the movies from the drop points at 2am and trucks them to a shipping center for the 4am shift. By the end of this year Netflix expects to have a total of 50 shipping centers and 50 drop points. TorrentFreak: GetAmnesty.com: MPAA Extortion at its Finest. The MPAA and their fellow anti-piracy organizations send out thousands of infringement notices. Only a fraction of these are played out in court, and those that do make it into court are settled at an early stage. So why not circumvent the whole legal system, and gently coerce people to pay for “amnesty”? If you steal and get caught, pay up. The problem is that the MPAA is going after people who realize that, even if they are innocent, it might be easier to pay up than go through the courts. GigaOM has an interesting story that takes a look at how HD video content will be delivered, Akamai Gets Ready for HD Video. Afergan argues that CDNs are even more important when it comes to distributing larger files, especially the HD kind. A typical 2-hour feature-length movie would need to be encoded at a bit rate of at least 6-8 megabits per second, which would result in a file of 5-8 gigabytes in size.